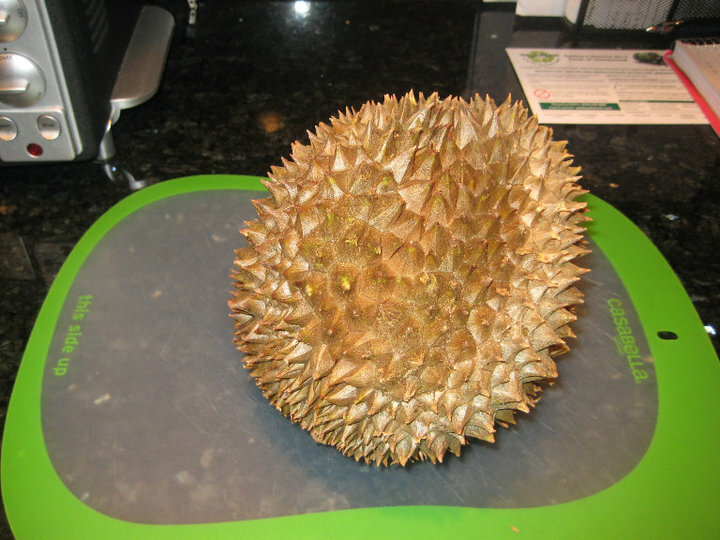 KITCHEN TESTED – Durian is a Fruit? By Melinda Strauss, 01/28/2011, In Dessert, Sweet, What Was I Thinking? 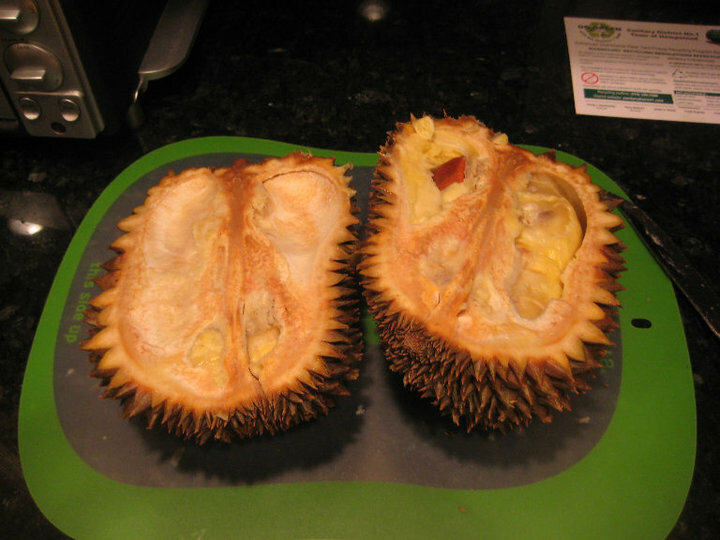 Home » Dessert » Durian is a Fruit? Is it really a fruit? Even Andrew Zimmer won’t eat it! And why does it smell so darn bad! 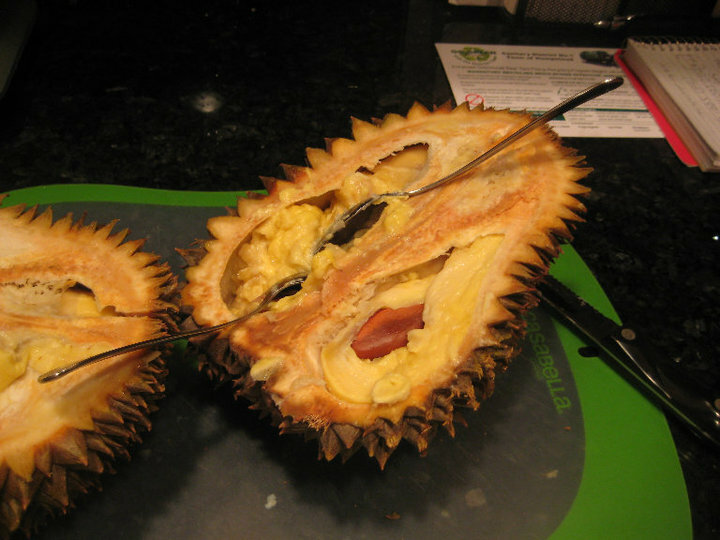 The durian fruit is called the “king of fruits” in Southeast Asia, which just baffles my mind. When opened, this, um, fruit smells so overpowering that it is actually offensive. As my kitchen begins to fill with the odors of rotten onions and gym socks, I wonder why I ever cut this scary thing open in the first place. And I’m sure you’re thinking the same thing. Justin and I watch the Travel Channel all the time and our favorite show on that network is Bizarre Foods with Andrew Zimmern. Andrew will eat pretty much anything, from live bugs to animal intestines (from any animal). There are only a few food items that he won’t eat, and Durian is one of them. Living by the saying “try everything twice,” Andrew will take a taste of the odorous fruit without exception but he almost always spits it right back out. Taking a note from Andrew, we have always wanted to try every type of food we can find, even the disturbing ones. Because we are strictly kosher, most of those unique foods, such as street food in pretty much any country except Israel, are off limits. So when Justin found the durian fruit in a China Town in New York City, he just HAD to buy it. That night, we got right to work on the stinky (and very sharp) fruit. The inside was filled with a strangely mushy substance, and a very strong odor, and it almost turned me away but I held on! I took one bit and it wasn’t too bad but certainly not tasty. Then I took another bite, since Andrew says I should try everything twice, and the second was not as good as the first. In fact, it was so bad that I wouldn’t go back for more. 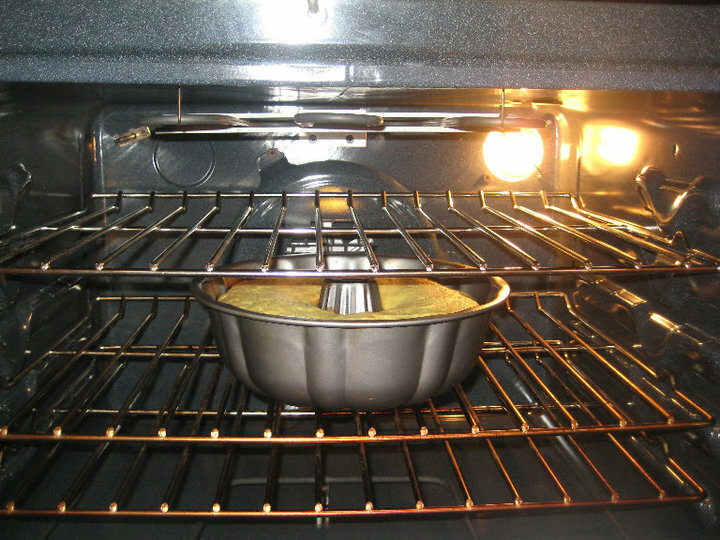 So instead, I decided to bake a cake! Justin found a recipe online (that I won’t even share with you since it was awful) and we went right to it. Well, you see how that turned out! Didn’t taste very good either. But I did learn a valuable lesson: try everything twice, even if it doesn’t taste good. 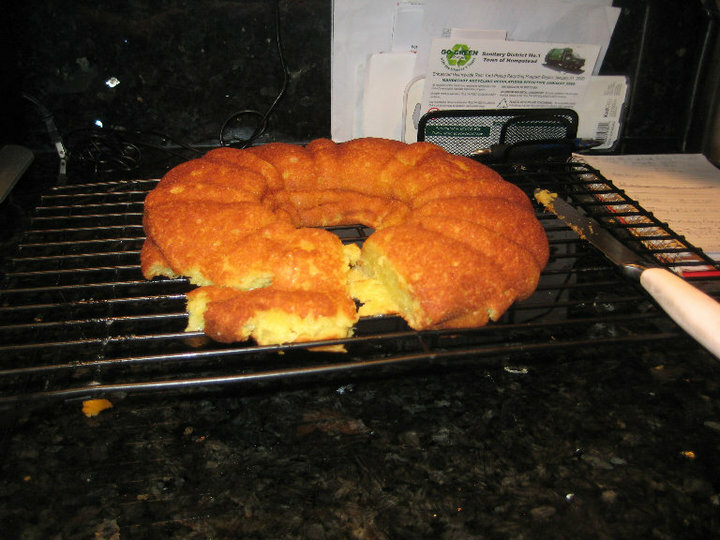 And the cake might turn out flat, but it was worth it. At least now I know how the durian tastes. While I don’t expect you to run out and try the durian fruit (but if you find one, go ahead and buy it), I hope you take a lesson from this post to try everything at least twice. You never know what you will like! At least that’s what I tell my son, Zach. One Comment on "Durian is a Fruit?"